Ascension (Hampartsoum) is one of the most joyous of the feasts recognized by the Armenian Church and the Armenian people. It is the last of the dominical events of Jesus’ life as set forth in the Gospel. Two of the Evangelists, Mark and Luke, end their writings with the event of the Ascension, with a description of its details. After the miraculous Ascension, Jesus appeared before the disciples numerous times, sometimes singularly and sometimes collectively. The Evangelists have given many accounts and much testimony concerning these encounters. It took place on the 40th day after His Resurrection. Jesus was with the eleven disciples, again in the Upper Chamber, which had become virtually a regular meeting place. He gave His final instructions to those who had remained loyal. It was an emotional moment. He advised them not to begin widespread teaching until the Descent of the Holy Spirit (Pentecost), when through it they would be endowed with new power and ability. Then, visible only to the disciples, He arose and went toward the Mount of Olives. Having reached its summit He stopped. He gave His farewell to all and pointed to the heaven whence He had come and where He would be going. Immediately, the Ascension began. The disciples were fascinated by the scene. It was a sacred moment. Only through the intervention of two angels were the disciples restored to the immediacy and made aware of the new reality. With the miraculous event of the Ascension, Jesus was completing His Godly mission, for which purpose He had become man, preached, was tortured, and finally with His blood consecrated the salvation of mankind, to show the true LIFE and the WAY leading to it. 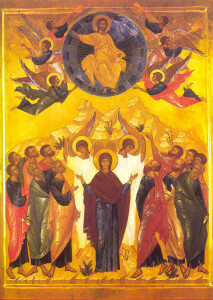 The episode of the Ascension is described in the New Testament in Mark 16:19; Luke 24:50-51; and Acts 1:9-11. It occurred, based on our present calendar, on May 18, in the year 30. Ten days later, on May 28, came the Descent of the Holy Spirit (Hokekaloust, Pentecost).